The message for WW1 is one of bravery and sacrifice. When war was declared on August 4, 1914 men from the Edmonton region rushed to join up. Edmonton had two militia regiments – the 19thAlberta Dragoons and 101stRegiment (Edmonton Fusiliers). These actively began to recruit and the two became the basis of the 9thBattalion, Canadian Expeditionary Force. As early as September 1914, a contingent of over 1,200 men left for Valcartier, Quebec for training. At the same time, recruitment began for the 51st, 151st, 63rd, 66th, 138th, 194th, 202ndand 218th Battalions. The Edmonton Morning Bulletinnoted that by November more than 12,000 men had enlisted in the region. Many of the men recently arrived from the United Kingdom and their loyalty was to King and Country. As a result of their experiences on the front, a deep love of Canada was forged that resulted in a surge of patriotism and a strong sense of national identity. On the Home Front, women took over care of families, filled positions in the work force left empty by enlisted men, and also raised funds for the war effort. For the first time, the number of young women exceeded young men in University of Alberta classes since 484 staff and students joined up. Hospital facilities in the province shifted their focus to mending broken bodies and lengthy convalescences as the first battle casualties returned. Existing mental asylums were inadequate to address the flood of men suffering from shell shock (PTSD). Those left on the Home Front dealt with food rationing, helping those who had lost husbands, brothers or sons on the Front, and also sent parcels with socks, handkerchiefs, cigarettes and other “soldier comforts.” Governments also struggled to provide financial resources to support women left without breadwinners. The Armistice of Compiègne, named for the place in France where it was signed by the Allies and Germany, resulted in a ceasefire at 11 am Paris time on November 11, 1918. In the next months, war-weary men returned home. The joy of homecoming and family reunions was marred by the difficulties of dealing with the Spanish Flu pandemic that raged during 1918 and 1919. Hospitals and nursing homes could not cope with the sick and dying. The total death count was 3,259 Albertans, just under half the casualties on the Front. Re-integrating soldiers into the work force also presented enormous challenges – there just were not enough jobs in a province and country gripped by an economic recession. The Winnipeg General Strike, which began on May 15, 1919, spread across the country and found enormous support in mines around Alberta including the many in Edmonton located on both banks of the North Saskatchewan River. Some returning soldiers, who had joined the Alberta Provincial Police, found themselves pitted against miners on the picket lines to defend company interests. After experiencing the horrors of war not only the military but also the civilian population were united in the belief that war must be avoided at all costs in the future. Soldier members of the Alberta Legislature posed on the steps of the building, Edmonton, Alberta, 1918, McDermid Studio, Glenbow Archives NC-6-3143. 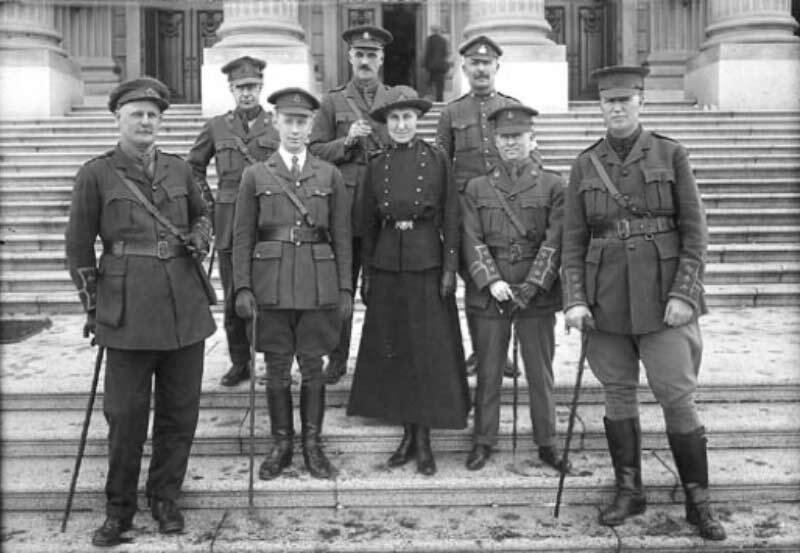 From L-R: back, Lieutenant James Gray Turgeon (Liberal, Ribstone riding), Major Robert B. Eaton (Liberal, Hand Hills), Sergeant Gordon MacDonald (Liberal, Pembina); front: Lieutenant Francis A. Walker (Liberal, Victoria), Major James Robert Lowery (Conservative, Alexandra), Nursing Sister Roberta MacAdams (Conservative, Soldiers Overseas), Captain Charle Stueart Pingle (Liberal, Redcliff), Captain Robert Pearson (non-partisan, Province at Large). The photo appeared in the Edmonton Journal, March 25, 1918. Total enlistment from Alberta was 48,885 (35.1 percent of the male population of 277,256); of these, 6,140 were killed in action and about 20,000 were wounded. The Edmonton Drill Hall (today’s of Prince of Wales Armouries), designed by prominent local architect E. C. Hopkins, was planned as a home for the local militias as early as 1907 but was completed during the war. It is now the home of the City of Edmonton Archives and the Loyal Edmonton Regiment Museum. In 1914 Edmonton’s population totaled 72,516; by 1917, it had declined to about 56,000. Enlistments accounted for at least some of this decline. Roberta MacAdams, a pioneer in the establishment of Women’s Institutes in Alberta, moved to Edmonton in 1914 to set up the Department of Domestic Economy for the Edmonton Public School Board. She enlisted in 1916 and served with the Medical Corps. In 1917, the first year in which Alberta women were able to vote and run for political office provincially, she ran under the slogan “Give your other vote to the Sister” and was elected to the Alberta Legislative Assembly. For more historical information visit The Loyal Edmonton Regiment Museum: http://www.lermuseum.org/.